The STP steam generator is a very powerful and reliable steam unit. Steam generators are fabricated from high quality stainless steel sheets that are highly resistant to corrosion. They have an integrated water detection system that relay signal to automatically fill water in the tank when needed. It has a standby mode option that allows water inside to stay close to its boiling point which produces steam quickly after switching on. While in standby mode, it only consumes a small amount of energy to maintain the water temperature. The steam generator is well insulated with ceramic fiber and can withstand heat up to 1,200°C. In rare cases of maintenance, the heating elements are very easy to remove from its housing. 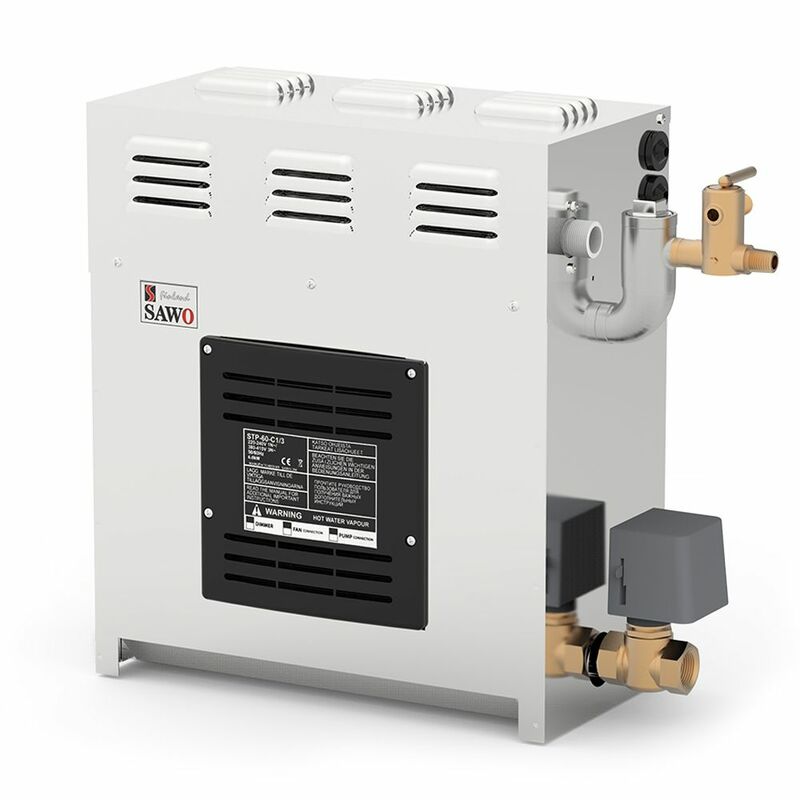 Sawo STP steam generators are controled by a separate LCD Touch Screen control panel. It is made from thick hairline stainless steel which can be mounted on a concrete or acrylic surface. This omniscient control is perfect for modern design steam rooms. - 7.5m RJ12 cable for control panel and steam generator connection. - 1 steam nozzle for 4,5 kW - 7,5 kW steam generators and 2 steam nozzles for 9,0 kW - 15,0 kW steam generators. - Temperature sensor with wire and sensor holder. - Autodrain valve. You may install autodrain valve either to the side or to the bottom of the steam generator. For more information please read additional documentation which are available for download below.